First days of school can be awkward. Wardrobe malfunctions, new classes, and new kids: starting middle, high school, or college can be the source of many anxieties. But, no matter how awkward your first day, these pop culture kids have had it just as bad. Take a step away from the memory of your first day of school and rejoice in the awkward. And remember, school will get so much better as time goes on, just like it did for these pop culture icons. 1. Cory Matthews, Boy Meets World– Boy Meets World is a wonderful tale of growing up in a normal family, in a normal neighborhood, at a normal high school. Boy Meets World stole the hearts of many 90’s kids and has yet to give them back. Everyone related to the antics of Cory Matthews, which makes watching his first day equally relieving and pretty hard. Cory’s first day of high school is full of bullies, the floppy-haired Shaun shutting himself into a locker and wearing fake sideburns to look older, and embarrassing Topanga encounters. 2. Cady Heron, Mean Girls- The story of Cady Heron is quoted from freshman dorms to sorority houses to high school film clubs all throughout the nation. Mean Girls is the teen movie of our generation. We will never forget that on Wednesdays we wear pink, that three pounds is just the right amount to loose to fit into your spring fling dress, or that girls can be so mean to each other, they forget what is really important, being strong female friends and role models. Cady Heron’s first day is full of her new besties, Damian and Janis, introducing her to all of the different types of students at North Shore. Like any high school there are “The Jocks…The Sexually Active Band Geeks…The Girls Who Eat Their Feelings and The Girls Who Eat Nothing… The Best People You’ll Ever Meet, and The Worst: Beware of the Plastics”. 3. The Cosby Kids, The Cosby Show– The Cosby Show taught us about family, growing up, and the lives of one funny doctor dad, one of the most amazing lawyer/TV moms, Clair Huxtable, and their adorable children. The Cosby Kids all have their problems on the first day of school, from fitting in, to “mean teachers,” to cutting the sleeves off of a sweater to look more cool, to name calling in a first grade classroom. The kids soon learn that nothing can make you feel better than a chat with your parents and a little understanding. 4. Jenna Hamilton, Awkward.- We love Awkward. here at TYF! No one seems to have as bad of luck as Jenna Hamilton. And while her problems might not resonate with all teens-picking between boys in a love triangle situation and dealing with the aftermath of her mom sending a horrible letter telling her to change- we can all see a bit of ourselves in one of the characters and laugh out some of our stress when we see Jenna and her friends do something so “high school” and so silly. 5. Schmidt and Jenko, 21 Jump Street– This movie, what can you even say. Hilarious? Check. Outrageous? Check. Raunchy. Check. Cheesy, great one-liners, and a wonderful high school comedy? Check, check, and check. Schmidt and Jenko go undercover and back to school in this quasi-crime comedy. Doing some research and reflecting back to their own high-school days, the pair believes they are going to take the school by storm. They put their backpacks on one shoulder, drive their gas-guzzling car too fast into handicapped space, and get in a fight, all things that make them the laughing stock of a 2012 classroom. 6. DJ Tanner, Full House– Full House had a moral for every story. As the girls grew, we saw their lives play out in “real time” which allowed us to learn from the mistakes of the girls and their caretakers. The lessons the Tanner girls’s “three dads” taught them as they went through elementary school crushes, to middle school friends, to first boyfriends, to dance drama, to hanging out with the always-there Kimmy Gibbler, kept us hanging on to the positive and hilarious world of Full House. DJ’s first day of back to Jr. High taught the audience one of the greatest morals Full House had to share. DJ learns that the only way to fit in is to be yourself. She tries to share jokes with the popular girls and wear the perfect hair and outfit on her first day but it all backfires. DJ must be herself to gain true friendship, a lesson every middle and high schooler should remember! 7. 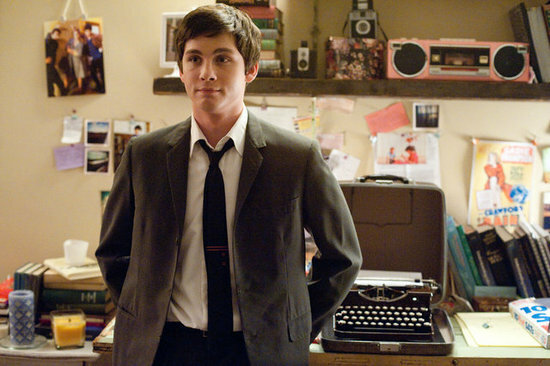 Charile, The Perks of Being a Wallflower– Perks, in my humble opinion, is one of the best book to movie transitions of late. Perks is the perfect read for any high schooler. Charlie suffers from some pretty serious problems but the story is a triumphant one. It shows that every one of has a little bit of a problem. Every one of us has some geek inside. And we can find people who will connect with us and share in our struggles and happiness. Bill: You know they say if you make one friend on your first day you’ll do good. Charlie: If my English teacher is the only friend I make today, that’ll be sorta depressing. 8. 8. Sabrina, Sabrina the Teenage Witch– Sabrina has bigger problems than surviving high school; she needs to uncover the family secret and become a full-blown witch, all while maintain the secret of her true supernatural self while keeping friendships in the human world. Can you say #witchproblems ? Sabrina’s first day starts out awkward. She’s having a hard time keeping her secret; the temptation to use magic in the “real-world” is too great for her. But, take Sabrina’s story as some inspiration, with the help of family and friends, and a little magic, Sabrina turned her first day around. Sure, she got to relive it, but it just goes to show you that everything gets better with time, even the most embarrassing days in high school. 9. The Students of James K. Polk Middle School, Ned’s Declassified School Survival Guide– No one taught us how to survive middle school better than Ned. Ned shares his tips and tricks of fitting in and making middle school work all the while hanging out with his awesome friends, Cookie and Moze. Cookie’s, Moze’s, and Ned’s first day is hilarious. Cookie refuses to take off his puffy jacket and has a heat stroke, Moze doesn’t tell the pair that she’s going to take woodshop, leaving Cookie and Ned to make a hilarious speech to gain entry into the class, and Lisa Zemo’s crush on Cookie is announced, as she sprays her nose with saline. 10. T.J. Henderson, Smart Guy– Although Smart Guy had a run of only 51 episodes, the life and times of T.J. Henderson, 10-year-old super-genius, made for an adorable television series. The show touched on topics ranging from sibling rivalry, to dating, to the importance of studying and doing your own work to get ahead in school. T.J. Henderson’s first day in high school isn’t awkward so much as it is unique. He does a great job of trying to fit in and charm, and doesn’t show any concern or hardship on his adorable little face even though he skipped all of middle school! Some more awkwardness: Teen Wolf, 10 Things I Hate About You, Sister, Sister, Looking for Alaska, The Middle, and Friday Night Lights have their own awkward first days of school and are worth checking out if you’re in the mood for a teen drama or comedy. Feel free to share your favorite first days of school in pop culture (or in your life) in the comments below! !